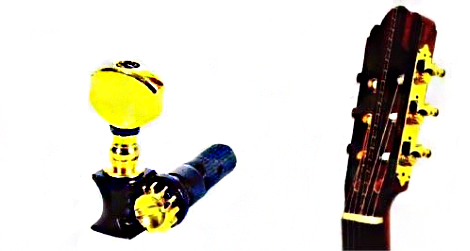 We are proud to introduce to you our Ny-Loc tuning machines for nylon stringed instruments. Now classical guitar players can tune their guitars and play with the same confidence the steel string players have been experiencing for decades. Your strings can stay in tune longer! Simply replace your stock tuners now with a set of Sperzel NyLoc Tuners to experience the difference. The Ny-Loc System is a patented friction locking system with the look of vintage sting posts. The Ny-Loc needs no measuring to restring! Feed the string through the hole and pull until tight. Next, wrap the string aroung the grooved nylon sleeve once and then tune to pitch as usual. The last step is to cut the excess string and play. Our EZ re-string method eliminates the trouble with restringing using stock tuners, but please note that you will need to re-adjust the fine tuning as your string stretch into place. We are proud to say Made in the U.S.A. From parts made in our factory in Cleveland Ohio U.S.A. and assembled in our plant by American workers. Our finishing is also done in the states; Aluminum parts plated in Denver Colorado, Anodizing colors in Indianapolis, black and satin in Mentor, Ohio. Small parts plated at Chromatic, Cleveland Ohio, and Chromium Process in Connecticut New England U.S.A.
We are not like some guitar companies or other tuning key manufactures that Claim Made in U.S.A. see if they will publicly state where they get their parts from.